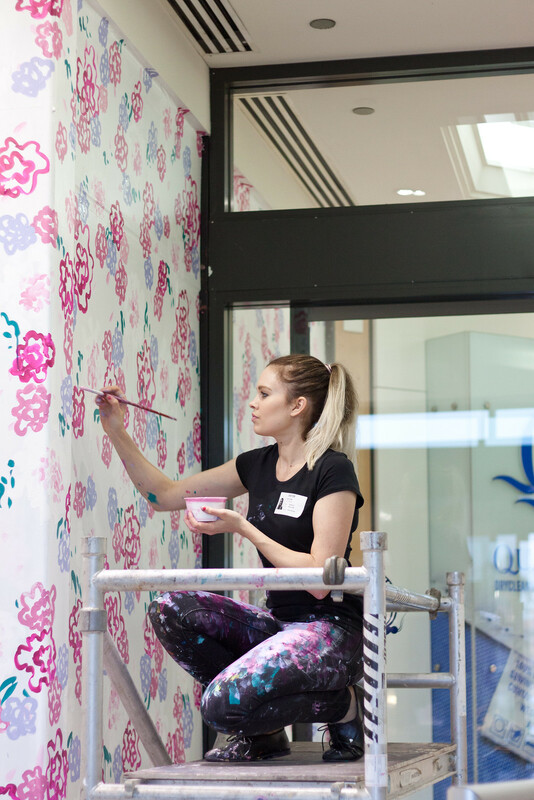 Linzi Carter, an up and coming local artist, has just spent the whole weekend painting a mural titled Portraits of Spring at Karrinyup shopping centre (our local hang). 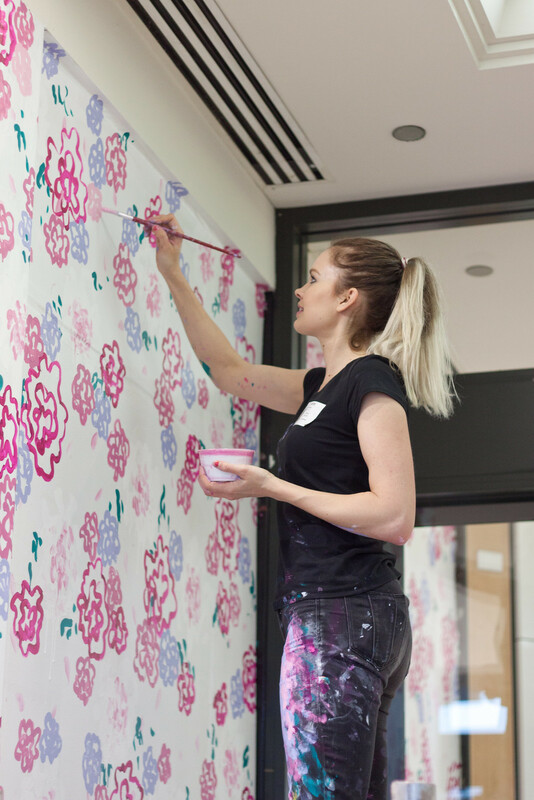 Linzi, originally from country WA, paints the kind of paintings & murals you want to see everywhere. It's bad-mood-curing art. Happy, bright, inviting and lively art. After chatting to Linzi herself, you can easily see that her personality is reflected in her work and that she truly loves what she does. I'm a contemporary artist from WA, I grew up on a wheat and sheep farm in Cunderdin and moved to Perth to do high school. I am super blessed to have an amazingly supportive and creative family, my nan was a china painter and my mum, my biggest inspiration, is also an artist in her own right, embroidering, sewing, water colouring, calligraphy-ing and lots of other "ings". I completed a Bachelor of Graphic Design at Curtin, studied Visual Art at ECU and am currently studying a Dip-Ed in Art Teaching. 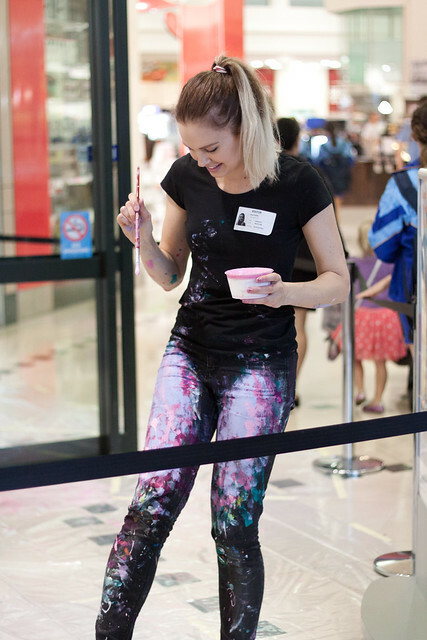 This year I went full time as an artist, painting murals in cafes, shops and shopping centres, offices, display homes, commissioned paintings for various clients and also teach art workshops for kids and adults. Can you tell us a bit about how you started to get into art? Since I was a kid, I loved painting and drawing. My earliest memory is learning to draw by copying my older sister's illustrations in her diary. (She also is super creative) To fast forward, I can say that my career really started about 8 years ago when I used to spend hours sipping coffee and drawing patterns and illustrations, using those connector faber-castell pens to colour them in. Meanwhile I started utilising this illustrative technique and sketching designs on boards and painting meticulously inside the lines. It wasn't until later that I developed the loose impressionist style that I roll with now. Your work is so bright and happy, have you always been attracted to colour? Absolutely yes. I am addicted to colours. I just can't seem to get them bright enough. Lol. One painting I did just recently,was so fluro and contrasting that my eyes started going cross-eyed from having to look at the design for so long whilst blending colours. My "power" colours seem to be orange and pink. Colour to me communicates so much meaning and emotion, so getting the correct tones, shades and hues in artworks is crucial. Does the way you paint translate into how you dress? Any hot favourite things you want to wear for Spring? 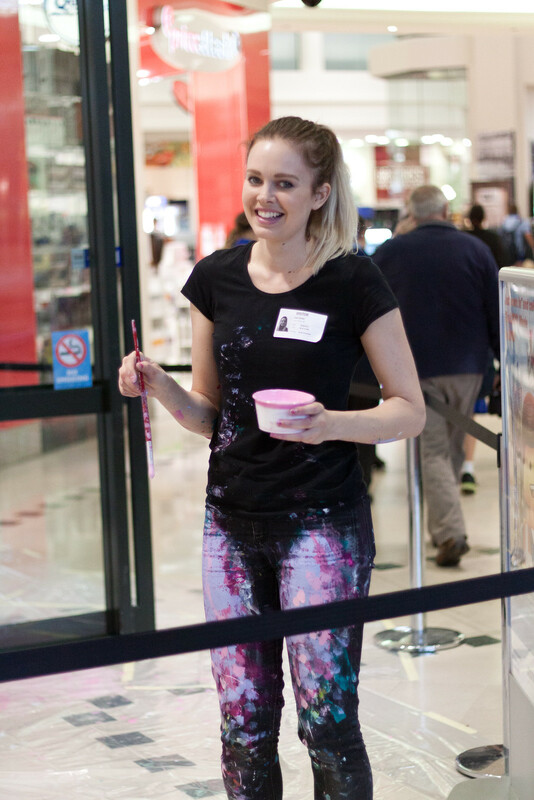 I spy on your Facebook that you do a lot of live painting and painting classes. How does painting around other people affect your work? Regarding live painting - I always think of the toothpaste analogy, when you squeeze the tube, the paste comes out. I find when I am under pressure or have a time limit, the best work flows out, possibly because it prohibits the perfectionist in me! But most of all, painting in front of people just seems to be something that I love and especially when the subject matter is something beautiful like flowers or a sunset, I love that my creativity can move someone emotionally or inspire them to want to express themselves and be creative. Teaching art also absolutely inspires me every time because every person is so unique. After doing a finger painting workshop with 3 and 4years olds, I did a crazy colourful mural in my studio-just using my hands and its become a prominent art work requested by clients for feature walls. Probably your most common question: favourite piece ever? My most impacting piece that I have painted live this year is one called 'Wings as Eagles' and it is of a multi coloured eagle soaring with its wings fully outstretched, surrounded with light. I wanted to paint something prophetic not just for me but to encourage other people to pursue your dreams and passions no matter what life can throw at you. The eagle can also be found on my website and business cards. Hands down, Monet and the impressionists and various street art/graffiti artists. If you could go anywhere and paint anything RIGHT now, what would you do? Where can readers see your work if they can't make it down to Karrinyup? My work can be viewed on my website, www.linzicarter.com and on Facebook and Instagram my page is called 'Linzi Carter Art'.